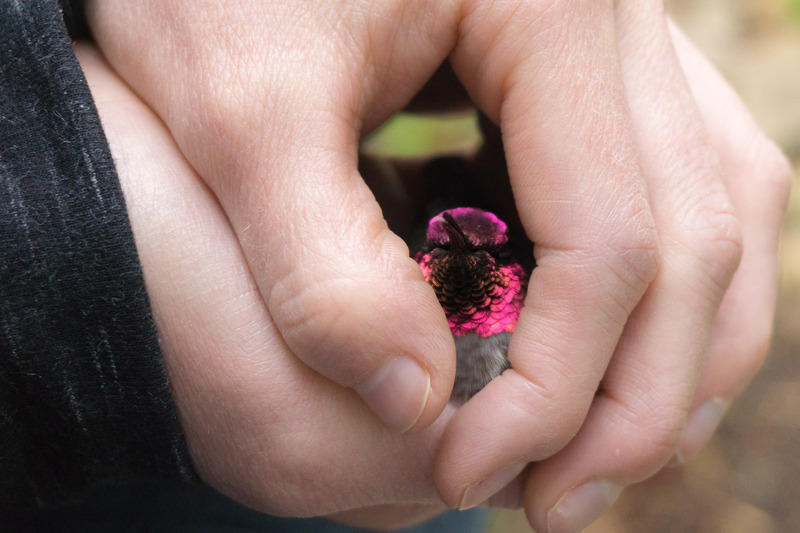 First thing this morning, we opened our front door to find a stunned Anna’s Hummingbird right next to the doorway. We can only assume it was in a territorial chase when it hit the front door and knocked itself silly. At first, we thought it was dead, but after Audrey scooped him up in her gentle hands, he quickly warmed up and started showing some signs of lift. We poured a tiny bit of sugar water into a humbutton and ever-so-gently pressed the tip of his beak into the feed hole. After 15 minutes of warming and some lapping up of the water, this little guy started flicking his wings a bit, opening his beak, and darting his tongue around. We moved the nursing operation back outside so that he could fly free one his wits returned. So, after another 30 minutes or so, he drank a bit more then started poking his head out from Audrey’s hands. As soon as she opened up her hands enough for him to stretch his wings, he took off for the nearest tree. We watched him gasping and flitting in the tree for another 45 minutes until he finally flew over to the bigger humbird feeder for a quick drink before being chased off by another territorial hummingbird. We don’t know the ultimate fate for this little warrior but can hope that he spent the rest of this sunny day recovering in his favorite tree and got to like plenty of nectar rich flowers.